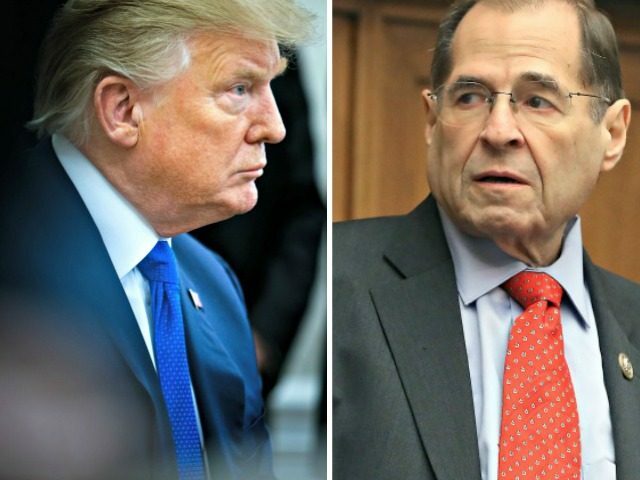 House Judiciary Committee Chairman Jerrold Nadler (D-NY) told a Sunday show host that Congress can impeach President Donald Trump for matters that are not crimes, and also for alleged acts that he claims Trump committed before becoming president, rejecting key limits that the Framers of the Constitution placed on Congress’s impeachment power. Nadler gave an interview to George Stephanapoulous on ABC’s This Week, laying out the long-term partisan Democrat’s plan to relentlessly attack President Trump, with the evident goal of ousting him from office. 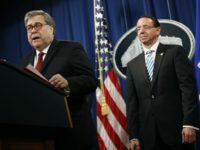 “Seeking to sabotage a fair election would be an impeachable offense,” Nadler declared, insisting that the president is “implicated” in “various crimes,” including crimes committed during the 2016 election. Nadler’s Judiciary Committee investigation will seek to establish the facts pertaining to the president’s actions during the 2016 election. Nadler made clear that he has already concluded that the president is guilty of “abuse of power,” “corruption,” and “obstruction of justice.” That last one is key, because it is a specific federal felony that could be cited as grounds for impeachment. But the list of allegations show that the New York partisan is quite serious, including “abuses of power, obstruction of justice, threats to the Mueller investigation, threats to witnesses,” and so on. Nadler also claimed that when President Trump criticizes Robert Mueller, that criticism is obstruction of justice, which is a felony. He also claims that President Trump’s firing James Comey as FBI director was obstruction of justice. He also insists that Congress can remove the president from office for matters that are not crimes. “So can there be impeachable offenses that are not crimes?” asked Stephanopoulous. Elsewhere, the Constitution adds that it takes a simple majority vote (50 percent plus one, or 218 in the modern House) in the House to impeach, and then a two-thirds supermajority vote (67 in the modern Senate) to remove an impeached president from office. The Constitution gives treason and bribery as examples of impeachable crimes. The best reading of that clause could be paraphrased as, “treason, bribery, or similarly serious crimes.” People can debate about whether lesser crimes can be treated as impeachable offenses, but they cannot debate about whether the Framers were talking about actual crimes. The Constitutional Convention debated having the Constitution say that a president could be removed for “maladministration” – that is, being a bad president – but deliberately decided against it. The Democrat-led U.S. House in 1974 included abuse of power as one of the impeachment articles against President Richard Nixon. Nadler did not discuss that, but it is sometimes mentioned in impeachment discussions. But impeaching for abuse of power is hard to reconcile with the original public meaning of the Impeachment Clause of the Constitution unless it is referring to criminal abuses of power. The 1970s were a decade that saw government officials frequently abandon the original meaning of the Constitution, perhaps most infamously with the Supreme Court’s 1973 Roe v. Wade decision – inventing out of thin air a constitutional right to abortion – but also the original meaning of the Constitution’s Establishment Clause in Lemon v. Kurtzman(1971), how the First Amendment’s Free Speech Clause applies to campaign-finance laws in Buckley v. Valeo(1976), and the proper scope of vital constitutional separation-of-powers principles such as Congress’s War Powers Act and vast expansions of federal powers over the environment and education. In other words, you want to take with a grain of salt conclusions about the Constitution that branches of government promulgated in the 1970s. It was not the U.S. government’s finest decade in that regard. Instead, what Nadler describes is roughly equivalent to a vote of no confidence against a British prime minister in the British system. Britain’s system of Parliamentary supremacy is hard to compare in many regards to America’s system of government, but the relevant difference here is that in America, the executive branch is independent from the legislative branch, separately elected by the American people through the Electoral College. We know that Nadler and other top Democrats do not like President Trump. That fact does not entitle them to cancel the results of the 2016 presidential election. The American people gave President Trump four years in the White House, and the Constitution only allows that to be cut short for impeachable crimes. Another disturbing aspect of Nadler’s claim is that it criminalizes politics. 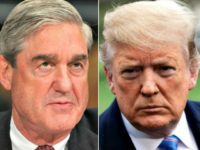 As an American citizen, the president continues to possess free speech rights under the First Amendment to criticize the government, including Mueller. It cannot be a crime for him to do so, and thus not an impeachable offense. Similarly, the FBI director serves at the pleasure of the president. The Appointments Clause in Article II of the Constitution provides that the president can fire at will any senior officer in government that he has the authority to fill through making a new appointment. It cannot be a crime for the president to exercise one of his core constitutional powers. Third, all the discussion in 1787 about impeachment power during the Constitutional Convention clearly referred to acts that the president committed during his tenure as president. Nothing said during the convention in Philadelphia suggested that it was possible for Congress to remove a president for something he did before he took his oath of office. Nadler is clearly broadening the House’s impeachment profile. He says that President Trump can be impeached for non-crimes, for exercising his constitutional prerogatives, and for any act he has committed at any point during the 70-plus years that he lived as a private citizen before becoming the 45th president. The American people have historically pushed back against such power grabs that threaten the constitutional separation of powers. It appears that Nadler is willing to take his chances in an effort to topple President Trump.